Why are we obsessed with the idea that brighter is better? First, forgive me – put your driving hat on! Do you think the safety of your car could be improved if you drove around town at night with your high beam headlights? Probably you’d agree that this would be counterproductive (and nobody does it). So let’s think about the back of your car. Would you drive around town at night with your rear foglight on because you felt it made you safer? No (and again, nobody does this). You’ve probably figured out that I’m asking why we don’t seem to apply the same logic to the back of our bikes. There, “the brighter the better” seems to be the rule of the day, and it’s interesting to wonder why. 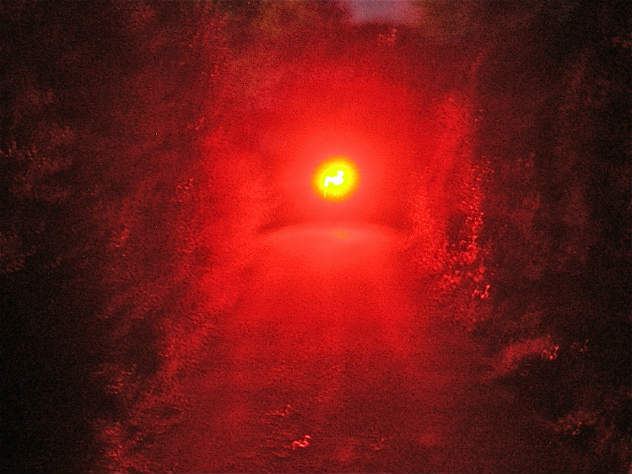 From 80’s “never-readies” to the current age of laser death beams, I’d always gone with the flow and bought successively brighter and badder lights for my bikes. That is until I decided to go for a dynamo when I got into audax a few years ago. Instead of packing multiple 1W LEDs, in dynamo tail lights you have a design which burns a mere ~50mW (0.05W) and has some clever focusing or diffusing technology. I admit I was unsure – my commuter at the time had three separate Smart Superflash LEDs on the back. But after countless thousands of miles in all weather and all conditions, from urban streets in rush hour and pub closing time to deserted glens, I’m more or less convinced that drivers can see dynamo tail lights. In case this is starting to sound like a dynamo commercial… there are lots of great reasons not to use a dynamo! It’s just that the visibility of the nice steady tail light simply isn’t one of them. Despite all the obvious counterexamples, people definitely seem to think that brighter tail lights are safer. A quick Google and you’ll find such gems as “SAVE YOUR Life, Ride Ultra BRIGHT, DAY And night” … followed up by “If you can look directly at the light, it’s not even close to being brite (sic) enough”. Not only do I disagree, I think that running an epic tail light is actively reducing your safety on the road. I was driving through Edinburgh recently at dusk when a rider joined the road up ahead. I was some way off, so he was perfectly safe jumping on, and he proceeded at a reasonable pace. Maybe it’s just been a while since last winter, but I found his rear light to be ferociously bright – just painful to drive behind. Rather than wait behind as we came up towards a pinch point for a railway bridge, I found myself dropping a gear and accelerating hard to get past. I didn’t cut it too fine, but since this is my commute I know that I’d have been shaking my head. Inevitably, I had to queue to turn right at the T-junction ahead and after maybe twenty seconds the rider had filtered past and I was being blasted by the red howitzer once more. I’m not sure of the brand – it had a regular flash going on but also an off-tempo nuclear strobe effect. What happened to this rider with the ultra brite light on the next bit of open road? Let’s just say that neither of the drivers in front of me wasted any time in ripping past him as he climbed the shallow gradient, even though it was tight with oncoming traffic. Neither did I, and neither did any of the cars I caught passing him in the rear-view. I’m probably the only one who felt guilty about it, too. If this guy bought his light on the basis that it would make him safer, then he really ought to ask for his money back! A headlight. It is not a tail-light. There are big differences! 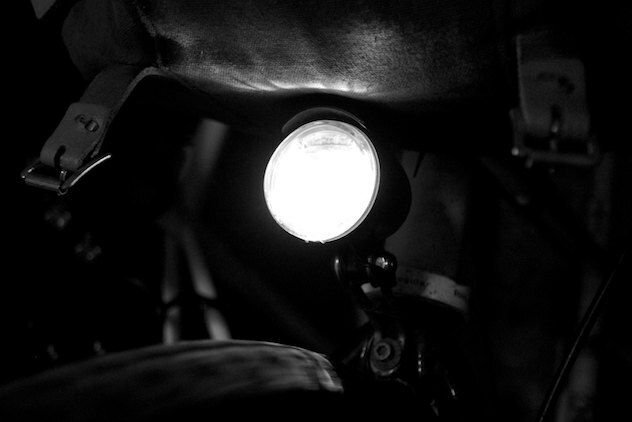 There is an optimum brightness for safe riding. A tail light just needs to be bright enough that motorists notice you (and can account for your course and speed). You blatantly don’t need an atomic tail light to achieve this – just look at the huge number of cyclists who have either no lights at all or the bare minimum. While I’d never advocate it, casualties from the practice are astonishingly low. If you pop out in your car, you’ll quickly reassure yourself at how easy it is to spot riders with even pretty pathetic tail lights. After that you’re relying on goodwill, and who ever thought that brighter lights create goodwill? There’s a strong argument for brighter headlights in safety terms, but tail lights aren’t headlights and there is a vital difference between them. When you increase the power of your front light, you are incentivising other road users in a way which promotes your own safety – motorists in oncoming vehicles (and those at side streets) have to actively decide that you aren’t as big as you look, and to actively decide to put themselves into your glare when waiting for a couple of seconds puts you out of the way. Uber tail lights also incentivise other road users, but they do not do so in a way which is beneficial for you. Drivers who find your light unpleasant are rewarded the faster they get past you, and it’s no secret that other cyclists don’t like riding behind Joe Death Star. Conversely, do you really think that taxi drivers who cut past you in the city’s bus lanes would decide to be more responsible if only you had more photons at your disposal? They’re actually deciding based on a layman’s knowledge of bike lighting that you do or don’t deserve a legal amount of space? Really? No, it’s simply faulty thinking to imagine that a brighter tail light will get more attention and more consideration from other road users. You need to be visible – you don’t need to be obnoxious. I must plead guilty I am afraid. 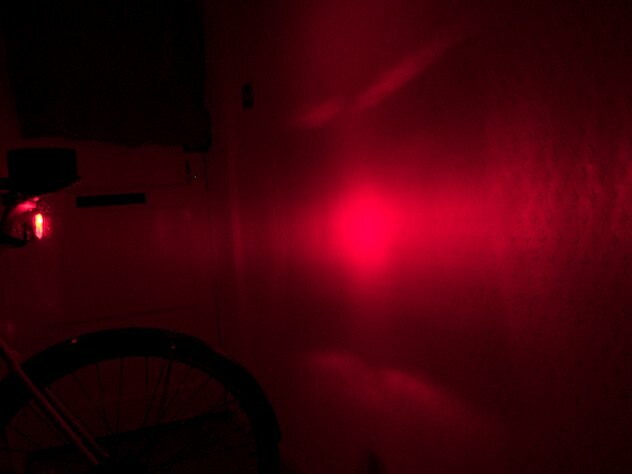 I run two Radbot 1000 1w lights on my commuter (my tourer but has a Busch & Mueller dynamo rear light). Slightly in my defence I do mount my Radbot 1000s down low on my rear chain stays (DF) and low down on the seat stays (Bacchetta Giro) to try to minimise the negative aspects of using such bright lights. On a positive note, I have had one motorist stop ahead of me to ask me about the lights as he found me very easy to see and was impressed by them. A second motorist has also commented positively at a set of traffic lights. I don’t know if they have upset other riders or drivers so I don’t have balanced feedback but :(. I will be converting the Bacchetta Giro over to dynamo power before winter in 2014 (Australia here) and will then go with a Busch & Mueller tail light (probably the brake light type). I will be interested in how that works out; hopefully favourably as being hit from behind is a significant cause of crashes involving cyclists here in Australia. Rather than wait behind as we came up towards a pinch point for a railway bridge, I found myself dropping a gear and accelerating hard to get past. You found yourself doing this….? @Aushiker – I’m not sure that they qualify as crazy back lights, although I’m not familiar with the model. I think your standard sort of 1W light (the kind where you actually get a day or two from AAA batteries, i.e. nowhere near 1W of real power output) are fine, but certainly as bright as you need. I’m thinking more of the integrated rechargeable tail lights that seem to be getting more common. The idea of having bright lights, then not having them high up and pointing straight back is common too. I’m not sure whether anyone manufactures an equivalent light which is less bright (so gets better battery life) and can just be pointed straight back instead, but you’d think it would be a no-brainer? @Simon: was there a question in there? In your not so humble opinion. If i’m am obnoxious then you saw me. Put down yer phone and pay attention when you operate your 2 ton contraption and I’ll dim my light on my 25lb bike. Out of the two options, you’d rather have an annoyed motorist rush to get past you than one who sees you and isn’t pissed off, holds back and gives you more space? Good luck with that! Ultra bright car lights make anything less ultra bright disappear – and this escalation is maybe one reason why cyclists think they need to compete. I run my recliner in town with a rear Niterider Cherry Bomb on during the day and a Cateye on front. I don’t bother about fluorescent clothing. Probably do this as a knee jerk reaction to the ‘get a flag’ comments that you can sometimes get from other road users. I had a taxi overtake and cut me up to halt 100 yards up a street despite this. Or maybe it was because of this if your observations are correct! Who knows? He did see me as he had to go by me but completely misjudged my speed. One other point… German and contintental laws mean flashing rear lights are not allowed as they are reckoned to confuse following vehicles. Here I think road users (both powered and unpowered) go to extremes to be seen (or not seen in the case of unlit cars and bikes). Bright lighting is now so cheap that it’s also hard to buy anything else. Having a wider lit up area to make it easier to estimate distance is a great strategy (or wearing something reflective that gives you scale). That doesn’t mean that there aren’t scenarios where someone fell on the border between two amounts of light, but then you’re trading off annoying people who are already driving frustrated and angry with people who mean you well, but wouldn’t have seen you with a normal sort of light. I don’t know how that balance works out in the real world? I agree if lights are too bright they can be distracting to drivers and other cyclists. Although I whole-heartedly agree that lights can be too “bright”… they are usually to “intense”. Light can be either focused or dispersed. I find highly focused tail lights to be annoying and insufficient at the same time. Annoying in that when you are on-axis with the beam, all it does is make you look away. This is more often an issue if you follow the light for a time. Insufficient due to the fact that they are barely, if at all sufficiently bright from a side or off-axis view. These are often mistaken as an odd reflection and subconsciously ignored. So this discussion really needs to clarify lux vs. lumens. What I want is for a car’s driver to notice me when they suddenly come upon my bike as I am rounding a curve in the trees… or where a driver is in a bright sunlit zone and I just ducked into the shade. I don’t want a light that is highly dependent on the angle of approach. I do want a light that will be “on” during the earliest moment when I surprise the driver. And I want that light to be consistent as drivers carefully plan a safe pass. I build my own lights; I use spherical lenses with the emitter close to the lens; And I plan my runtime. Correct, a very bright LED at 1 amp is nearly as bright as a bright LED at 1.4 amps. But my lights don’t have a tight beam pattern. You can see it from 45 degrees the same as on-axis. No bike rider ever complains about my lights when they follow me. …and they would say; believe me! Agree with the fact that at night you probably don’t need that much output and that a few lights for scale is a better bet. However there are other situations where I’ve wished I had something absurd on the back. Cycling down a fast A road into the setting sun is one such occasion where I’ve been really scared of someone ploughing into the back of me at 60. I’d rather be annoying in that situation. I’m not sure what the best thing is for riding into the setting sun. You can’t easily compete with an entire star… perhaps someone will come up with a lensing system that allows you to basically create a reflection ‘through’ your bike that makes it obvious to following traffic? It really does need tidying up! Traffic lights are definitely getting brighter. There are some up my road that are painful to ride past. Nice opinion piece. No evidence presented to support it though, so it’s still just opinion, not fact. Perhaps you could try writing a similar article disparaging the stupidly bright headlights used by some drivers? Even better, one pointing out that it is illegal to use spot and fog lamps in towns or where visibility is more than 100 metres? Slightly more useful than suggesting that cyclist rear lamps are too bright, especially since the prevalence of “Sorry Mate, I didn’t See You” incidents doesn’t seem to be falling. How could an opinion piece ever be fact? Anyway after all these years I have a new bugbear. Traffic signs that are so reflective they are painful to look at (even with a bike headlight). What’s that about!